Open Road Films has set October 13, 2017 for the nationwide release of MARSHALL starring Chadwick Boseman (upcoming “Black Panther,” “42,” “Captain America: Civil War,” “Get on Up”) as legendary attorney and Supreme Court Justice Thurgood Marshall, Josh Gad (“Frozen,” “The Wedding Ringer,” upcoming “Beauty and the Beast”) as lawyer Sam Friedman, Kate Hudson (“Mother’s Day,” Oscar® nominee for “Almost Famous”), Dan Stevens (upcoming “Beauty and the Beast,” “Downton Abbey”), James Cromwell (Oscar® nominee for “Babe”), Sterling K. Brown (Emmy® winner for “The People vs. O.J. Simpson,” NBC’s “This Is Us”) and Keesha Sharp (“The People v. O.J. Simpson: American Crime Story”). Oscar® nominee Reginald Hudlin (producer of “Django Unchained”) is directing and Paula Wagner (“Mission: Impossible,” “The Last Samurai”) is producing through her Chestnut Ridge Productions banner along with Jonathan Sanger (“The Elephant Man”) and Hudlin. Financiers of MARSHALL are Star Light Media, Inc., Hero Film, Ltd. and Sky Legend. Executive producers are Peter Luo and Belton Lee. Sony Pictures Worldwide Acquisitions is handling international distribution of MARSHALL. 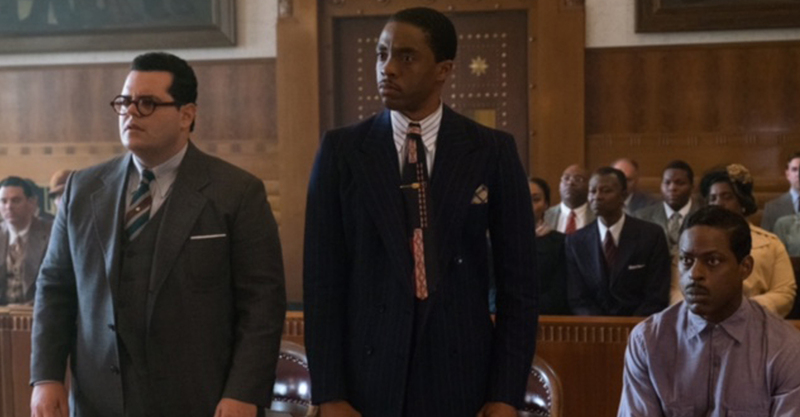 MARSHALL is based on a true incident in the life of Thurgood Marshall, when he was a young lawyer, long before his appointment to the U.S. Supreme Court. As the nation teeters on the brink of WWII, a nearly bankrupt NAACP sends Marshall to conservative Connecticut to defend a black chauffeur against his wealthy socialite employer in a sexual assault and attempted murder trial that quickly became tabloid fodder. In need of a high profile victory but muzzled by a segregationist court, Marshall is partnered with Samuel Friedman, a young Jewish lawyer who has never tried a case. Marshall and Friedman struggle against a hostile storm of fear and prejudice, driven to discover the truth in the sensationalized trial which helped set the groundwork for the Civil Rights Movement to come. The screenplay for MARSHALL is a unique collaboration between renowned trial lawyer, Michael Koskoff, and his son, screenwriter Jacob Koskoff (“Macbeth”). MARSHALL is being produced with the full support of the Thurgood Marshall and Samuel Friedman estates, including their children, John W. Marshall and Lauren Friedman.